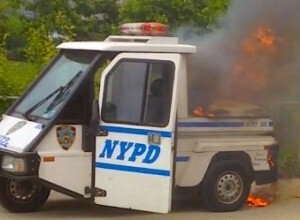 Karl and his cam were on hand around noon today when a small NYPD vehicle caught fire on the path next to Pier 1, Brooklyn Bridge Park, producing an impressive plume of smoke. He was able to get some good video until one of the gens d’armes (Hey! It’s Bastille Day) objected (update: to use a favorite Finkism, objected err somethin’). Video after the jump. NYPD shoos Karl away from harm. 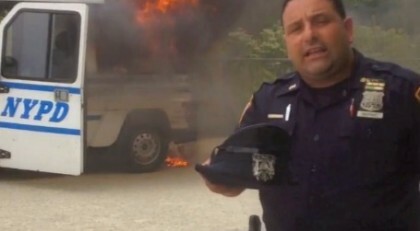 Publisher’s note: We would like to thank the NYPD officer who asked Karl to stop video taping the fire. While commenters here seem to think the officer was attempting to stomp out coverage of a local news event, we can only assume that the officer was only very concerned about Mr. J’s safety and we thank him. Seriously folks, Karl wasn’t dancing or anything like that.